Fearing legislators might not renew funding for Medicaid’s expanded rolls, Montana’s hospitals and other health advocacy groups have come up with a ballot measure to keep it going — and to pay for it with a tobacco tax. Amanda Cahill works for the American Heart Association and is spokesperson for Healthy Montana, the coalition backing the measure, which will be on Tuesday’s ballot. She says coalition members knew big tobacco would fight back. If ballot initiative I-185 passes, it will mean an additional $2 per pack tax on cigarettes, and a tax on other tobacco products. It would also levee a tax on e-cigarettes, which are currently not taxed in Montana. The tobacco tax initiative has become the most expensive ballot measure race in Montana history — drawing more than $17 million in opposition funding from tobacco companies alone — in a state with fewer than 200,000 smokers. Most of that money has come from cigarette maker Altria. According to records from the National Center for Money in Politics, that’s more money than Altria has spent on any state proposition nationwide since the center started keeping track in 2004. “What we want to do is — No. 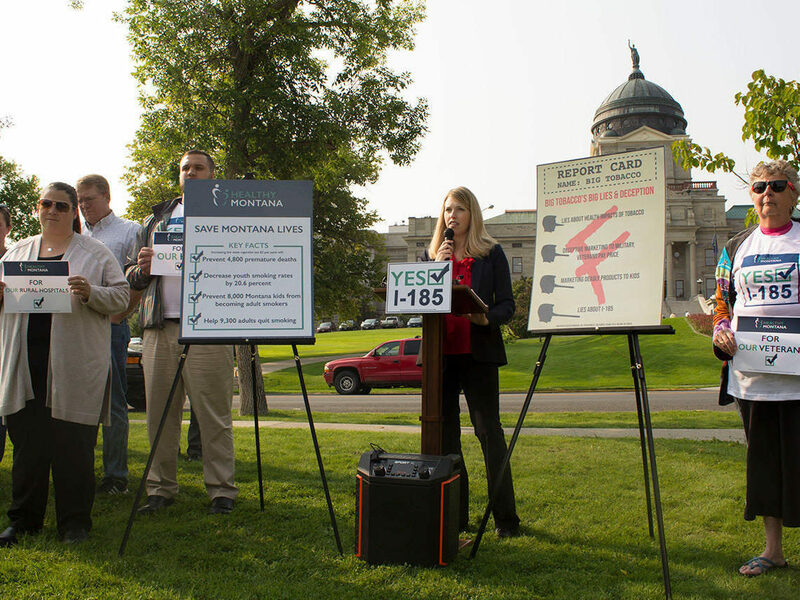 1 — stop Big Tobacco’s hold on Montana,” Cahill says. Also, she continues, it’s imperative that the nearly 100,000 people in Montana who have Medicaid under the expansion will be able to keep their health care. Cahill says I-185 will allocate plenty of money to cover the expansion, though some lawmakers say the state can’t afford it. Ballance also isn’t in favor of ballot initiatives that, she says, try to go around what she sees as core functions of the legislature: deciding how much revenue the state needs, for example, or where it should come from, or how it should be spent. Most citizens, she says, don’t have the time or expertise to develop that sort of in-depth understanding of a complicated issue. Montana’s initiative to keep Medicaid’s expansion going would be a “double whammy” for tobacco companies, says Ben Miller, the chief strategy officer for the nonprofit Wellbeing Trust. “People who are covered are more likely to not smoke than people who are uninsured,” says Miller, who has studied tobacco tax policies for years. He notes research showing that people with lower incomes are more likely than those with higher incomes to smoke; and if they’re uninsured, they’re less likely to quit. Montana’s health department says that each year more than 1,600 people in the state die from tobacco-related illnesses. This story is part of NPR’s reporting partnership with Montana Public Radio and Kaiser Health News.